Learn more about building a TerraWise home on your lot. TerraWise Homes can build the perfect home for existing lot owners just about anywhere in Jacksonville. Our On Your Lot program offers the opportunity to build an energy efficient TerraWise Homes plan on land you already own. Or, if you don't have a lot, contact our sales team for lots we have available or to find a lot for you. Click to view an overview of Cedar Bay. 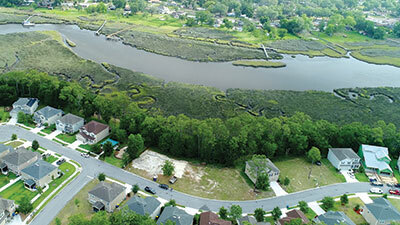 Build On Your Lot anywhere in Jacksonville and Northeast Florida. An Aerial photograph of our Cedar Bay Community looking out over the Broward River. Contact us to learn more about building a TerraWise Home on your lot.